History of Amsterdam: With its charming ring of canals, historic houses and unique architecture, Amsterdam is arguably Europe’s quirkiest city. But how did it become the spirited place it is today? We’re going to explore a brief history of this dazzling destination and discover what makes it so exceptional. Founded a way back in the 12th century by some lucky fishermen who clocked the perfect spot to settle, Amsterdam was originally a small fishing village located by the Amstel River. From then on, the city predominately traded in beer (something it’s still renowned for today) and herring. The Amsterdam Museum tells its unique story from conception right up until current times, and is an excellent source for history buffs. History of Amsterdam: The network of canals which flow through the city where constructed as far back as the 14th century and helped to boost trade by enabling merchants to import and export goods with ease. Nowadays tourists can enjoy boat rides along these famous waterways, dine alfresco on the many outside terraces, or even enjoy the flamboyancy of the floating flower market. 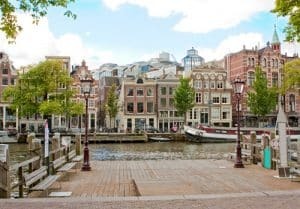 Amsterdam really began to flourish during the 17th century when the economy boomed thanks to the establishment of the Amsterdam Stock Exchange and the founding of the Dutch East India Company. Subsequently, it became world famous for trading in goods like tobacco, wheat, diamonds, and even guns. This thriving success meant Amsterdam became the first commercial city in the whole of Europe with a growing population of 200,00. The period of economic growth (known as the Golden Age), was also the age of exploration and Dutch sailors travelled all over the globe to bring back exotic discoveries like spices and silk for the wealthy to enjoy. It was also the time of a cultural renaissance and artists like Rembrandt lead the way in visual expression. Today Amsterdam proudly embraces this rich cultural history, and there are many museums and galleries dedicated to its notable artists including the Van Gogh Museum and the Rembrandt House Museum. Well worth a visit for cultural connoisseurs! Nothing lasts forever, and all good things come to an end. Sadly Amsterdam was no different, and the successful Golden Age was succeeded by a tumultuous period blighted by conflict. The 18th century witnessed numerous invasions from surrounding neighbouring countries like France and England, while much later in 1940, and with the outbreak of the second world war, the Nazis invaded and Amsterdam lost 10% of its population. The Anne Frank House Museum displays a harrowing exhibit and tells a very personal story regarding these tumultuous years. Presently, Amsterdam is loved for its liberal and laid back attitude, diverse cultural heritage, and eclectic up-beat atmosphere. It makes it an ideal location for short city breaks where accommodation like the Hostel Sarphati means an affordable and comfortable stay near to the centre of everything. It really is a must-see destination for art lovers, foodies and anyone who wants to experience something a little bit quirky for their next travel adventure.